Things to do in West Virginia! The movie “Battleship” is a story about a sneak attack of earth by aliens and the role of a battleship in defense of our world. A little over sixty years ago a similar scenario played out in the Pacific at a place called Pearl Harbor. The battleships lined up there stood no chance; however, against the sneak attack by the Empire of Japan. 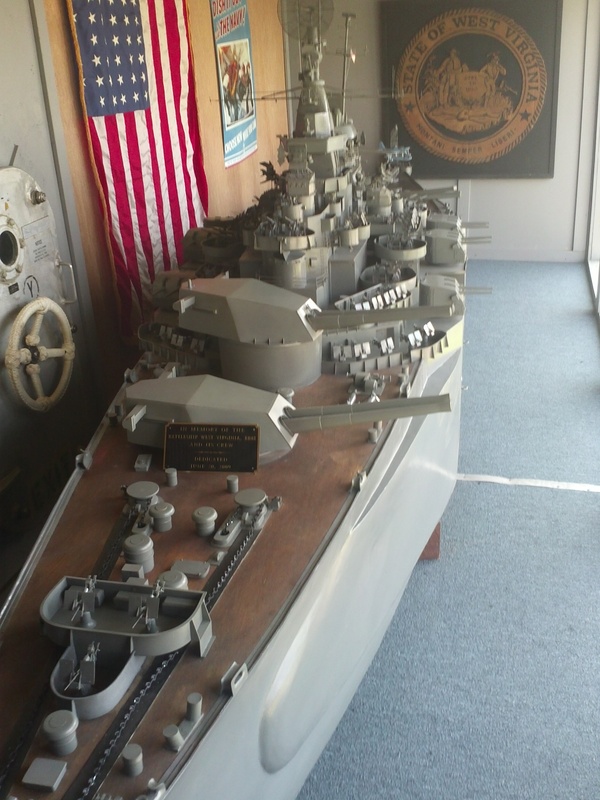 One of those battleships, the USS West Virginia, can be seen today on display in Beckley, WV. 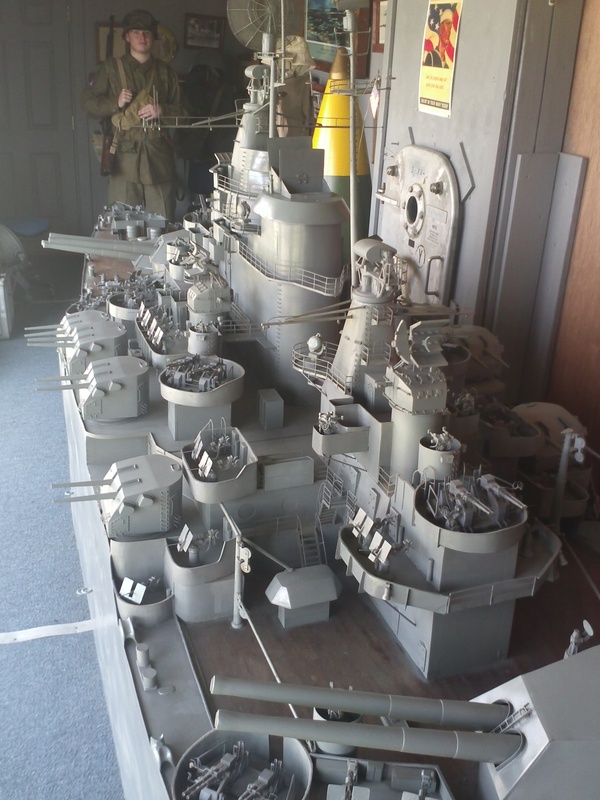 “A battleship in Beckley, WV,” You ask? If you don’t believe me check out the pictures below. USS West Virginia from near deck level. 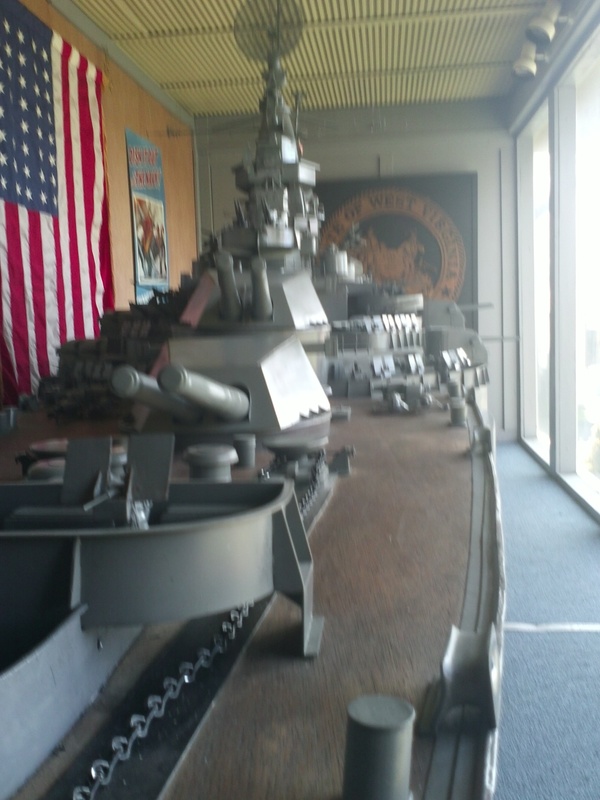 The ship was built by, Jim Toler, the curator for the Raleigh County Veterans Museum [Tourism: History – > History – WWII – > Museums] located on Harper Road in Beckley. Jim sailed the ship, which was built to carry two men, on one voyage and now you can see the ship as she used look. I’d give you some of the dimensions of the ships and tell you how long it took Jim to build the ship. I’d even tell you about some of the household items he used to construct parts of the ship, such as the radar dishes, but then that would take away from the fun of discovery when you see the ship for the first time. Suffice it to say you will be amazed. The ship is the centerpiece to the museum, but it is far from the only attraction you will see while there. They also have the only surviving door from a German concentration camp. The horrors that took place behind that one door is difficult to imagine. 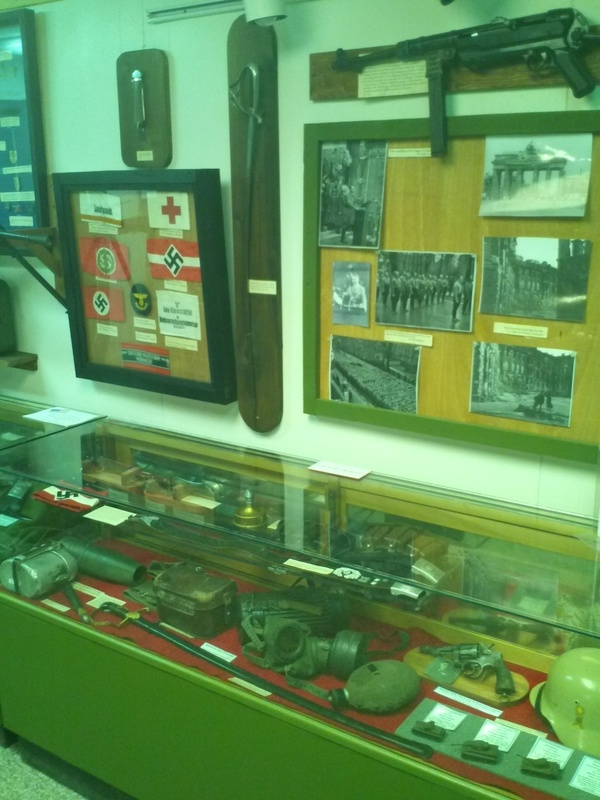 There is a helmet collection, guns, uniforms, knives, and many other fascinating collections of the tools of war. However, most compelling is the personal story’s of those that fought the wars to defend America. Memorial Day is a day we set aside to remember those men and women who contributed to our freedom from the sacrifices they made to serve our country, and the Raleigh County Veterans Museum helps us to remember. The good news is they are open every Wednesday, and Saturday from 1:00 to 6:00 and on Sunday from 1:00 to 5:oo. To find more information go to www.WVyourWay.com and click on the “Tourism” heading then scroll down and check the keywords, “History, History – WWII and Museums.” Then scroll down to the map and click on the “New River/Greenbrier Valley” and hit the “Search” button just below the map to find everything you’re interested in. 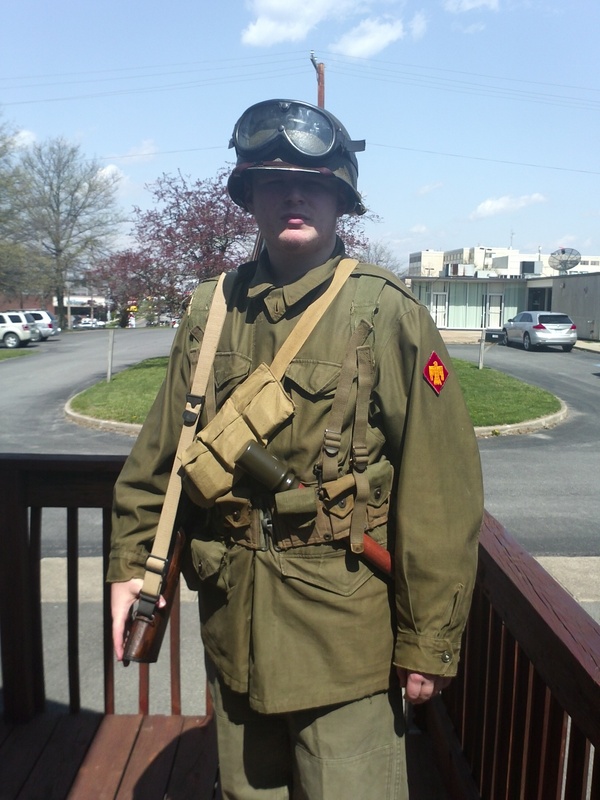 Joshua Brooks, my tour guide dressed in actual WWII uniform. West Virginia is a beautiful state with all kinds of adventures awaiting the person who wants to explore. I’m here to save you time by helping you find those things you’re most interested in. To that end, we use www.WVyourWay.com which allows users to find precisly what they’re searching for on the very first attempt. You don’t even have to guess at keywords! As a matter of a fact, you can find multipile unrelated interests in one search – and that’s guaranteed! This blog simply talks in a bit more detail about some of the exciting things there are to do in West Virginia as found on www.WVyourWay.com. Inquisineer – Another good WV blogger Find out even more about West Virginia! West Virginia Information Engine Find EVERYTHING you’re interested in with only ONE search!